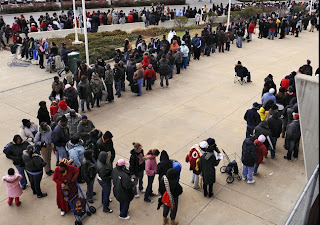 This is a shot of a part of the line up for the 90,000 lbs of food distribution organized in DC by the Redskins and Fedex. This Thanksgiving effort is likely to be something we will need more and more of in the coming months/years. The economic outlook is bad as we all know, and in times like these, families who are already struggling are the most vulnerable. So as we wrap up this Thanksgiving weekend, and we thank the fates for our family, friends and the food on our tables, I would ask you all to add a new charitable effort to your plans for the holidays and the new year. I know many of you already help in local efforts-- But we are all going to need to do even more. Think about it and commit yourself now. It is only by coming together and supporting each other that we are going to make it through this. What do you do now to help your community or the world at large? What new thing can you commit to for the months ahead?